You Can Always Disable AutoPlay for a USB or CDs or Portable Hard Disks Manually, by Holding Down the Shift Key and Inserting the Media. But some find it useless, tired, irritated or wanted to Get rid of AutoPlay Completely for the Sake of Simplicity, Avoiding Autoplay Popup Windows or To Avoid Auto-executing the Scripts those were in Media. 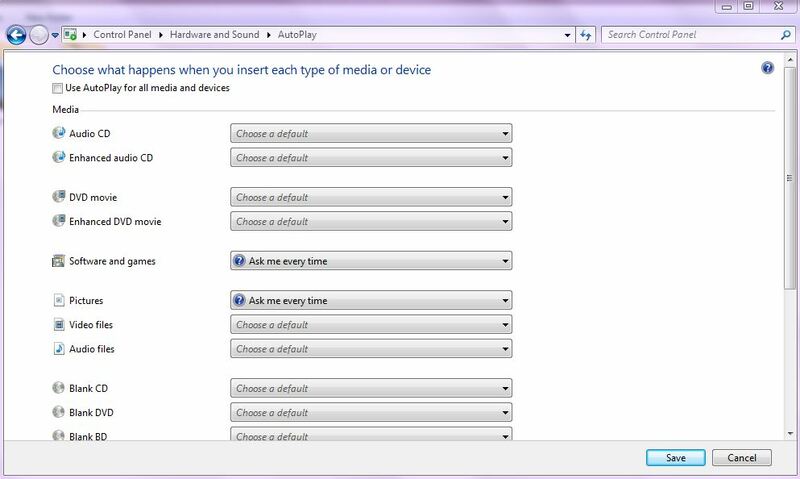 Goto “Start Menu-> Control Panel -> Hardware and Sound-> AutoPlay” and there you can Deselect the use AutoPlay for All Media and Devices, or You can Manually input settings for Individual Media types to act accordingly by the Media Type. Suppose for CDs to AutoPlay, but USBs to not, You can tell the Same here in settings.